In urban slang, signal-to-noise ratio (SNR) is a simple enough concept: the ratio of useful to useless information. We all know people whose SNR is not as high as we might hope. Unfortunately there’s no technology yet available to boost their SNR. So engineers can be happy that’s not true for RF signals. We can now extend SNR in wideband oscilloscope-based RF measurements through what’s known as “processing gain.” Digital down-conversion lets you see small pulsed RF signals next to large signals by reducing the noise level in a particular measurement—whether it’s RF pulse envelope characteristics or frequency or phase shift across a pulse. So how does it work? The trick is adding vector signal analysis (VSA) software. VSA in conjunction with an oscilloscope can extend the SNR. First VSA shifts a captured signal down to baseband I/Q. Then it bandpass filters the acquired oscilloscope data and finally resamples the data at a lower sample rate. The result is lower noise, higher dynamic range, and a wider SNR. Let’s look at an example: An 8 GHz-wideband oscilloscope captures a pulse train in which a large pulse is immediately followed by a small pulse that is 50 dB down from the first pulse. This corresponds to being 100,000 times lower in power and ~316 times smaller in voltage (sqrt[100,000]) than the first pulse. The two-pulse sequence then repeats. The large pulse has a +6 dBm power level (~1.4 mW), which results in a peak voltage of around 633 mV into 50 ohms. This can be represented as a -4 dBVpk level (20log 0.633). It also corresponds to a 1266 mV peak-to-peak signal into 50 ohms. In contrast, the small pulse, being 316 times smaller in voltage, is only 4 mV peak to peak (-44 dBm, -54 dBVpk). The VSA software, which also controls the oscilloscope front-end sensitivity, is set to +6 dBm (633 mV peak). This corresponds to an oscilloscope vertical range of 1266 mV. There are eight vertical divisions, so this also corresponds to a ~160 mV/div setting. At the full 8-Hz bandwidth for this ~160 mV/div setting, the broadband RMS noise for the 8 GHz bandwidth oscilloscope is around 5 mV, interpolating from a noise chart in the data sheet, as shown in Table 1. The 5 mV of noise translates roughly into a peak-to-peak noise that is three times the RMS noise (assuming Gaussian noise). In other words, we’re looking at 15 mV of peak-to-peak noise. The small pulse (4 mV p-p) is masked by the noise in the measurement (15 mV p-p). (Think how easily a big-mouth can drown out softer-spoken colleagues.) The small pulse can’t be well-discerned in the full 8-GHz measurement of the oscilloscope, with a linear scale and no averaging, as shown in Figure 1. Basic pulsed RF measurements can be made natively on a high-bandwidth oscilloscope. And there are certainly times that measurements on directly sampled signals are desired. But this isn’t one of those times. Instead we’re looking for advantages available through external signal processing and analysis on captured signals. For example, through a process called digital down-conversion, it’s possible to make a range of RF pulse measurements with higher accuracy. That’s due to the lower noise present by using processing gain. Let’s take a closer look. Figure 2 shows the basic process of digital down-conversion. Through digital signal processing, the oscilloscope samples are multiplied by the sine and cosine of an imaginary oscillator of frequency fc, where fc is generally chosen to be the center frequency of the signal of interest. In effect, we’re “tuning” to the frequency of the input signal. This process converts the time samples into real and imaginary number pairs that completely describe the behavior of the input signal. To reduce noise, these samples can be low-pass filtered and then re-sampled at a lower rate to reduce the size of the data set and allow FFT processing of the data at a later stage. The resulting digitally down-converted samples can then be placed into memory for further processing. Some important demodulation information comes from this digital down-conversion process. First, consider what happens when the digital local oscillator frequency Fc is equal to the carrier frequency of a modulated signal. The output of the digital filters, which includes the real part I(t) and imaginary part Q(t), consists of time-domain waveforms that represent the modulation on the carrier signal. Displaying the I-Q results in terms of magnitude coordinates gives us a view of the amplitude modulation. 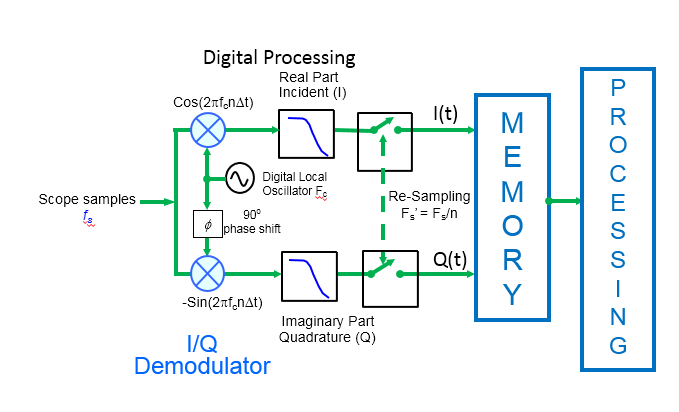 Displaying the I-Q results in terms of phase coordinates offers a view of the phase modulation. Taking the derivative of phase modulation yields the frequency modulation. By adjusting the width of the low-pass filters, you can set a defined span around the center frequency where the filter width is just wide enough to pass the signal of interest, but narrow enough to filter out a lot of the noise. So in short, processing gain “tunes” to the center frequency of the signal and “zooms” into the signal to analyze the modulation. Taking advantage of this processing gain, combined with VSA software’s ability to have a log magnitude scale, and using averaging, the 50-dB down pulse is now visible, as shown in Figure 3. The improvement in SNR realized through narrowing down the span is depicted graphically in Figure 4. You can draw a similar plot to see improvement in dynamic range possible when measuring narrow band signals, as shown in Figure 5. This does not describe the spur-free dynamic range (SFDR) or harmonic distortion characteristics of the oscilloscope response, but it does give an idea of where the noise floor will be in an FFT measurement. As the resolution bandwidth is decreased, and the noise is divided among smaller time buckets, the noise floor drops. This graph does not account for limitations due to various spurs, so the spur-free dynamic range (SFDR) remains limited to around 50 dB. Through the process of digital down-conversion, the SNR of an oscilloscope measurement can be significantly improved as a function of how much that measurement can be “spanned down” from the initial DC to 3dB bandwidth of the oscilloscope. As our example showed, a 50-dB down pulse, not even visible on a normal scope screen, can be clearly seen once processed by VSA software and then displayed in a log-magnitude scale. This approach can be very helpful to speed system validation measurements on Aerospace/Defense pulsed-RF signals. With this process, you can significantly improve measurement accuracy when evaluating the spectral, pulse envelope, frequency chirp, and phase shift characteristics of an RF pulse train.